The biggest need for the U.S. economy is to increase the amount of investment in physical, human, and knowledge capital. More investment is what the U.S. needs to remain competitive and boost productivity and incomes agoing forward. There’s no justification for throttling back on investment, no matter what your political stripe. Which U.S. Companies Invest the Most in the U.S? Imagine two companies. Both companies receive 50% of their revenues from overseas. One company has 80% of its physical assets–equipment and buildings– overseas, and 20% in the United States. The other company has 80% of its physical assets in the U.S., and 20% overseas. Which one is likely to generate more value and jobs for the U.S. economy? I’d argue that the company which invests in the U.S. is more like to generate jobs and value in this country. This was the reasoning behind PPI’s new list of “investment heroes”–the top 25 nonfinancial companies, ranked by domestic capital spending. These figures are not easy to obtain. Most companies do not split their capital spending by country, reporting only a global figure. So Diana Carew, the lead author on the project, had to reverse engineer the domestic capital spending figures from other information in the corporate financial reports. At the top of the list are AT&T and Verizon, which makes sense given the central role that mobile broadband is playing in today’s economy. It’s worth taking a look at the full list. 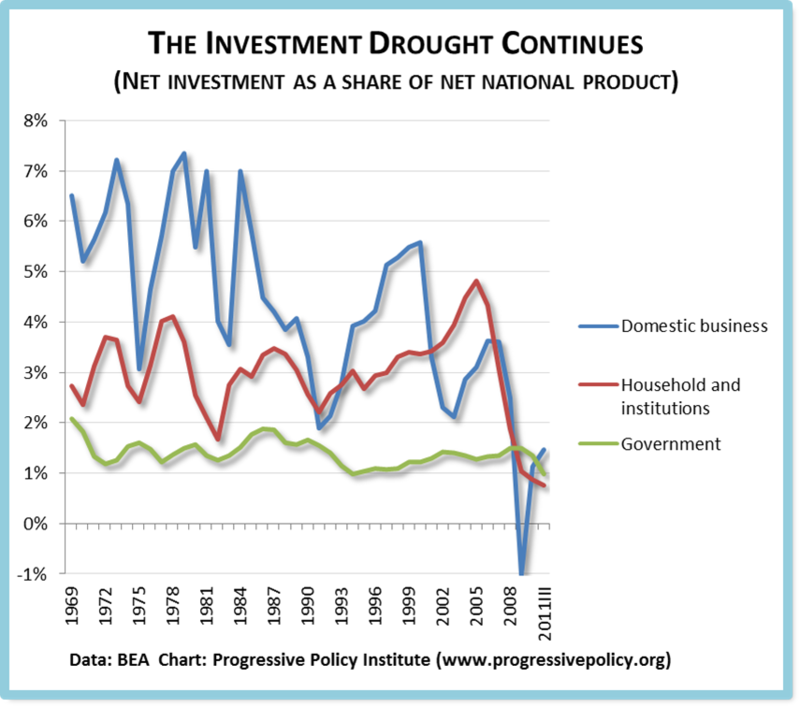 The Government Investment Drought Continues….. Sometimes things are not what we think they are. The conventional notion is that government has become more important under President Obama, while the private sector has stagnated. Yet in some ways the data tell a different story. Take a look at this chart. The top (blue) line shows that private nonresidential investment has rebounded smartly since early 2009, when President Obama took office. 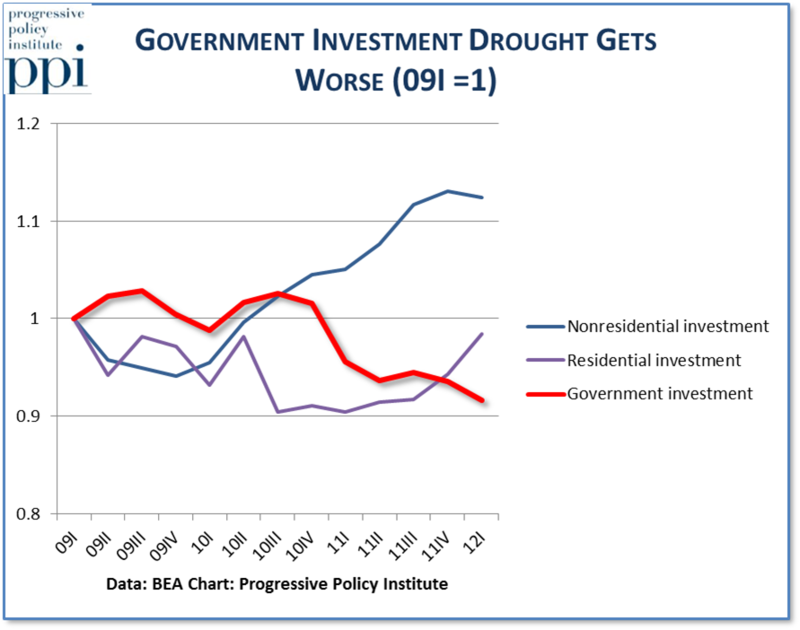 Residential investment first dropped, and then mostly came back. The real problem is government investment, which is down 8.3% since the first quarter of 2009, and still falling. In other words, government spending on infrastructure infrastructure, building, and equipment is declining, adjusted for prices changes. This is just utterly bizarre. In a time when the economy is still sluggish, government investment should be the simplest thing to pump up. We need to modernize our infrastructure and bring government into the 21st century, and it’s just not happening. Here’s another angle. 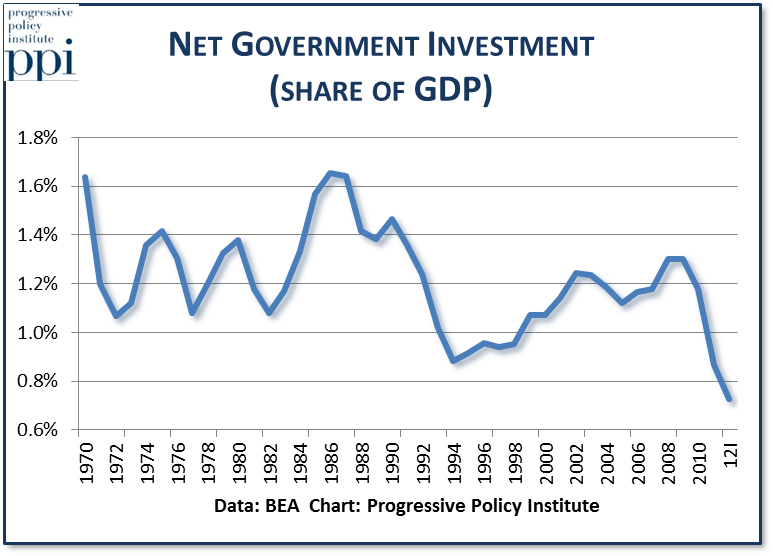 This chart shows net government investment as a share of GDP. According to this chart, net government investment is the smallest share of GDP in more than 40 years, and dropping. However, there’s another way to think about the Instagram purchase. Facebook just sent a strong signal to potential entrepreneurs and venture capitalists: If you have a good idea for an app, or can find someone with a good idea for an, you can get very rich very quickly by being acquired by a Facebook, or a Google, or a Microsoft. All of a sudden starting or financing a new company, with plenty of new employees, looks a lot more appealing. What about the argument that purchases like this one are just fueling a new bubble? My answer: Having lived through the boom and bust of the 2000s, I’d be very happy to get a repeat of the boom and bubble of the 1990s. At least the dot.com boom one left us with the Internet and a full cabinet of new capabilities, rather than a bunch of empty houses and bankrupt countries. 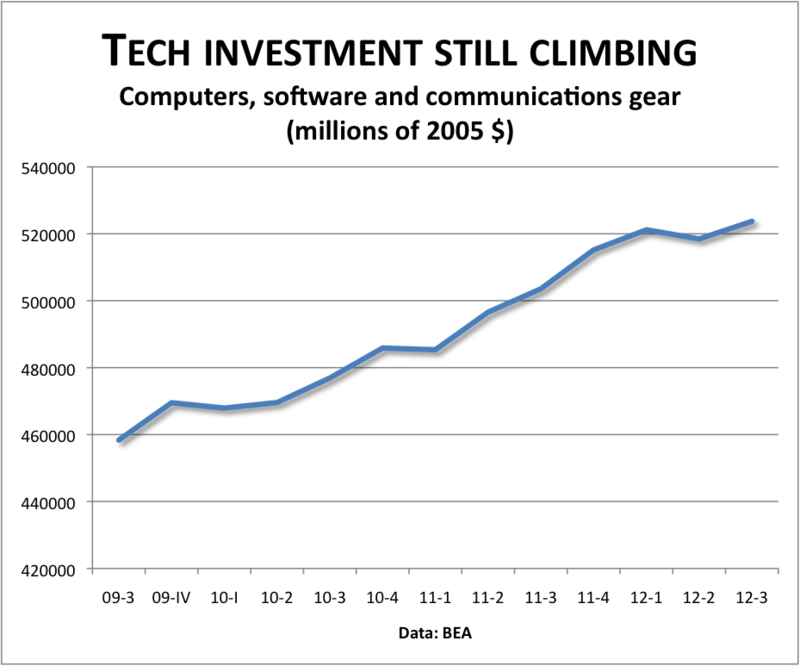 A technology bubble beats a financial bubble, any day of the week. I’m sorry, every time I hear about the need to boost consumer spending I have to stop myself from pounding the table. As we round into 2012, the real weakness in the economy lies on the investment side, not the consumption side. Take a look at the following graph of net domestic investment as a share of net domestic product (‘net’ means depreciation is subtracted). I consider this graph, which expands on one I gave to the Atlantic, to be my ‘chart of the year’. Despite rebounding from its recession valley, net business investment as a share of net domestic product is still far below historical levels. Household and institutional net investment as a share of net domestic product is at a 40-year low. And perhaps most disturbing, government net investment is only 1% of net domestic product, a 40-year low. Let me repeat that: Government net investment as a share of net domestic product is at a 40-year low. I had to check this last one a couple of times to make sure it was really true. This is a true failure of national economic policy. Government is punking out, just at the time when a public investment surge is needed to make up for the private investment drought. As a country, we should be investing more, not less. Update: The original post said ‘net national product’ where I meant to say ‘net domestic product’. Sorry.